This book is intended for parents and children to use together to nurture togetherness. This book is intended for parents and children to use together to nurture togetherness. The first section includes five simple strategies for raising children to live meaningful lives and to develop the virtues of their character. The second section contains 52 virtues, one for each week of the year, describing each virtue in simple terms, giving role play situations, how to practice it, and signs of success. It will engage family members of all ages in an exciting process of growth and discovery. Paperback-ISBN 0452278104 ITEM#-FVG 319 Pages (9″ x 7″ x .75″) Published in 1997 by Penguin Books of Canada Ltd. There are reflection cards to go along with this book. Family reflection cards are designed to be used with children. Classroom virtue reflection cards are designed with special care for classroom use. 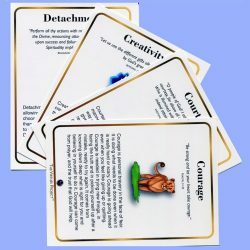 Virtue reflection cards are inspiration and designed for self use by adults. Another book by the same author is A Pace of Grace.